Planning to upgrade to a new SharePoint edition or migrate to a new server? With hundreds, thousands or millions of sites, many of them customized with SPD by power-users, and with thousands of documents that might also include hard-coded links to your older SharePoint server, now you can fix all these wrong/broken links in a reliable way and without losing so much time on manual fixes. SharePoint Find & Replace replaces hard-coded strings in SharePoint. This administration client-tool supports SharePoint 2013-2019 server, as well as SharePoint online (O365). KWizCom’s SharePoint Find & Replace will scan your SharePoint farm and will replace the existing strings with an updated string of your choosing. The tool includes a “Scan only” mode as well as a detailed log – both enable the admin to stay in control and easily monitor all string replacements. Define which tokens should be searched, for each token define with what alternative string it should be replaced. You can also import/export these tokens from/to a CSV file. Add the searched site collection urls. These sites can be in different farms, in your on-premises deployment and on Office 365 (SharePoint on-line). Find only (without actually replacing anything), and Replace. 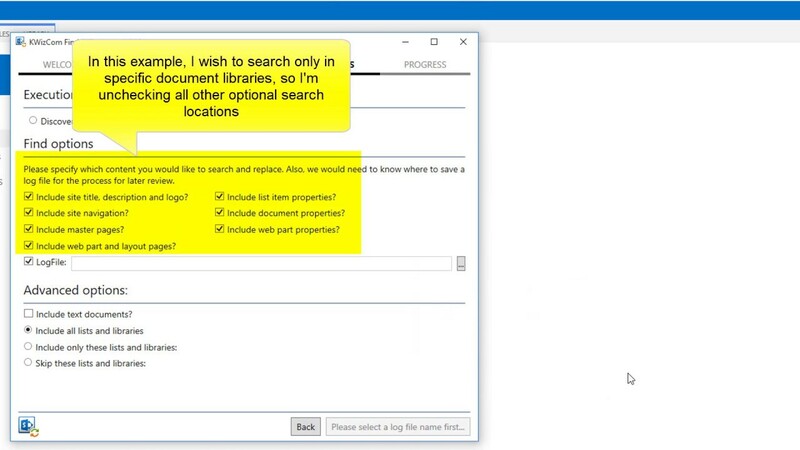 You can also fine-tune your search by selecting where exactly in SharePoint you’d like to search for your defined tokens. Real-time progress tab allows you to monitor the exact progress, and to pause/resume execution at any time. After execution is completed, a detailed log enables you to review where exactly the searched tokens were found and how many string replacements were done. You are no doubt aware that during the process of implementing SharePoint-based solutions, configuration changes often lead to a situation where hard-coded strings in the SharePoint information store are either not updated anymore, or even worse: they are simply wrong, pointing the user to a wrong location. For example, a “Favorites” links list item that directs users to “http://intranet/site” now needs to be changed to “http://extranet/site”. To learn more about the tool’s options, watch this Video Guide. Click the “Install” button to install the tool on your client machine. Once the installation completes, the tool UI will appear and you can start using it. For SharePoint on-premises this utility is licensed per-WFE server, meaning: every web front-end server requires a separate license. For SharePoint Online (Office 365) The Domain subscription covers one domain login, unlimited users.